SOCIAL POLICY | New Obama Administration Initiative : Target the "Unbanked"
Home / Business & Economy / North America / Social Policy / United States / SOCIAL POLICY | New Obama Administration Initiative : Target the "Unbanked"
The Obama Administration is launching a series of pilot programs, grants, and other initiatives to extend financial products and services to millions of unbanked households in the United States and abroad. Due in part to the lack of adequate savings in the wake of the Great Recession and subsequent global economic slowdown, inclusive banking systems have garnered significant attention among policymakers in recent years. But, as governments seek to enable their citizens to build more financial security and better fiscal futures, they scramble to connect the approximately two billion unbanked persons around the globe with safe and affordable financial services and products. To bridge the gap, research by groups like the YouthSave Consortium, a global financial inclusion partnership, is being lifted up by policymakers; cross-sector partnerships are being developed and fortified; and new, technological solutions are being examined by financial institutions. To bring researchers, industry leaders, government officials, and nonprofit professionals together to chart a path forward for American and global financial inclusion, the U.S. Department of the Treasury and U.S. Agency for International Development recently hosted a financial inclusion forum. Through a series of panels, the forum highlighted new research and identified actions steps across sector silos. In an interview at the forum with Bloomberg Business, Treasury Secretary Jack Lew said, “One of the things that needs to happen is it needs to be simple and inexpensive for people to get connected to the [financial] system.” Accordingly, the forum focused on three major themes affordability, simplicity, and safety. To drive these objectives, the Obama Administration initiative is putting technological innovation at its core. Among the forum’s participants were the Gates Foundation and JPMorgan Chase, which pledged to set aside resources to promote innovation in financial technology (referred to simply as fintech). Making good on their promise, these two organizations launched the $2.5 million Catalyst Fund this week. The fund is aimed at “[accelerating] promising startups and [spurring] innovation in financial inclusion in emerging markets.” Beginning next year, the international endeavor will deploy $2 million in grant capital and $1 million in in-kind advisory services to approximately 20 fintech companies worldwide. The Catalyst Fund also has a learning and exchange agenda, as it seeks to generate insights about financial services and products and share those lessons with the broader field of financial inclusion practitioners. In partnership with Village Capital, PayPal also pledged its support for entrepreneurs seeking technology-aided solutions for financial inclusion in the United States and Mexico. Domestically, several organizations are taking on the mantle of this work through research. On the heels on the financial inclusion forum, the Center for Financial Services Innovation released its annual Financially Underserved Market Size Study. It finds that American consumers spent $103 billion in fees and interest on alternative financial products and services in 2013. The report indicates that the underserved market is growing and could be a viable business opportunity for the mainstream financial industry. As an intermediary between underserved households and the financial sector, the federal government may have a role to play. 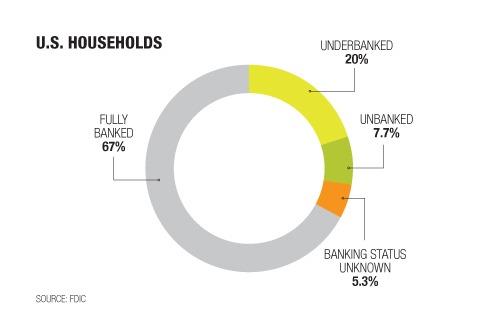 The Asset Building Program at New America has recommended using the public assistance system as a platform for efficiently targeting and reducing the rate of unbanked or underserved households. 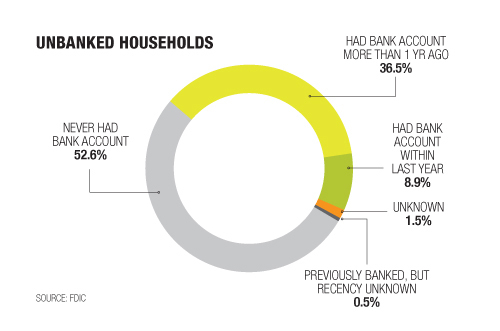 Families that receive Temporary Assistance for Needy Families (TANF) are particularly underserved by financial institutions, as they are 70 percent less likely than other low-income families to have a bank account. Nevertheless, many states already offer TANF participants some kind financial services. Therefore, there may be an opportunity to leverage this infrastructure to link low-income families up with the formal banking system. While there is a lot of work to be done to realize global financial inclusion, the new initiative by the Obama Administration represents a step in the right direction. As YouthSave discovered, ensuring that households have access to safe, affordable, and simplistic financial products and services takes a village. The goal is too ambitious for one stakeholder to accomplish on its own. Cross sector partnerships and technology can help build more capacity for broadened access to the financial system. By soliciting recommendations and buy-in from a diverse set of stakeholders, the financial inclusion forum of 2015 set an important precedent. Only time will tell its yield. Patricia Hart is a Program Associate in the Asset Building Program at New America where she provides research and analysis on a range of topics, including affordable housing, financial inclusion, and workforce development. She is a contributor to the Family Centered Social Policy Initiative and the YouthSave Global Assets Project. She also facilitates digital media, grant reporting, and events. Ms. Hart was a Communications and Advocacy Coordinator at FairVote prior to joining New America. In this role, she managed advocacy campaigns for increased women’s representation and community voting rights. She holds a B.A. in Political Science and Public Relations from Eastern Kentucky University.